Once steroid-associated osteonecrosis develops it becomes refractory to treatment, and when the femoral head is crushed severe coxalgia and disturbed ambulation become major issues affecting patient quality of life. For these reasons numerous studies have been undertaken to better define the pathophysiology of steroid-associated osteonecrosis and establish optimal prophylactic and therapeutic modalities. And although steroid-associated osteonecrosis has in general been attributed to ischemia, much remains unclear about both its underlying developmental mechanisms and pathophysiology . In organisms relying on aerobic respiration energy is produced by the reduction of oxygen, in the process of which reactive oxygen species are generated. On the other hand, cells possess antioxidant molecules against these reactive oxygen species, which comprehensively maintain the in vivo oxidation-reduction reaction in a state of equilibrium. However, when for whatever reason a tendency toward an oxidation state develops reactive oxygen and active nitrogen species increase in number, while that of antioxidant enzymes decreases. This unbalance has consequences such as intravascular endothelial injury, tissue injury, and cell necrosis, which in turn have been deeply implicated in the development and progression of diverse conditions including cancer, hypertension, and atherosclerosis . In steroid-associated femoral head necrosis as well, peroxidation occurring soon after steroid administration, namely oxidative stress, has been proposed to be a similarly important causative factor . Next, the mitochondrial electron transport chain in general accounts for ≥90% of oxygen consumption, 1∼5% of which is said to be converted into reactive oxygen species . This is said to explain why mitochondrial DNA is more susceptible to oxidative injury than the nucleus. Moreover, mitochondria themselves may potentially generate oxidative stress, making the intricate control of their function and number of importance for normal survival. In a nutritional environment in which ATP cannot be produced by the glycolytic pathway the number of mitochondria increases markedly. When nutrient starvation culture medium is substituted under these circumstances, the induction of mitochondria specific autophagy leads to an abrupt decrease in the quantity of mitochondria , while in the presence of a defective strain gene for mitochondria specific autophagy, an environment in which the quantity of mitochondria must decrease is created. When the quantity of mitochondria does not decrease in such an environment in which it should, mitochondrial DNA sustains severe oxidative injury, as a result of which, as previously reported, the majority of yeasts form specific colonies in strains having lost their oxidative phosphorylation ability. In such an environment in which mitochondrial function is not maintained, if the mitochondria themselves are not destroyed and their number not decreased survival itself may be endangered . Meanwhile, steroid-associated osteonecrosis is known to show a marked predilection for the femur and humerus, with no reports thus far describing involvement at other sites. This distribution suggests that the femur and humerus are more susceptible to stress and/or more readily develop an excessive response to steroid administration as compared with other sites. This prompted us to focus on oxidative injury, considered to be one of the developmental mechanisms of this disorder, in the present study. Using a rabbit model we investigated in the normal state the antioxidant enzymes SOD and catalase as related to mitochondria in the liver, kidney, heart, lung, humerus, and femur. In addition, to explore the relation between mitochondrial DNA and steroid-associated osteonecrosis, we serially determined SOD and catalase levels and mitochondria quantity in femora. Japanese white rabbits (mean weight 3.5kg) were injected into the gluteus with methylprednisolone (MP) 20mg/kg, and killed after 3 days (MP3 group), 5 days (MP5 group), and 14 days (MP14 group). As a Control group (C group) Japanese white rabbits not administered MP were used. In each group (n=10) femoral bone samples were extracted, and after fixation in 10% neutral buffered formalin and decalcification in formic acid, were embedded in paraffin. Then, they were cut into 4-μm-thick sections with a microtome in such a way that the maximum surface from the femoral head to neck could be observed. Multiple thinly cut sections were used in H-E-stained preparations to determine the presence/absence of osteonecrosis by light microscopy. The definition of osteonecrosis used in this model was based on that of Yamamoto et al. Namely osteonecrosis was considered to be present when necrosis of myelopoietic cells and adipocytes, and/or osteocyte empty lacunae and nuclear pyknosis were evident. When osteonecrosis was noted in either femur, osteonecrosis was defined as present in that sample. In C group liver, kidney, heart, humerus, and femur tissues were resected (n=3), while in MP3 group, MP5 group, and MP14 group femurs were resected (each group n=3), and each tissue frozen at -80℃. Some of the liver, kidney, heart, humerus, and femur tissues were each harvested, and after the addition of PRO―PREP (iNtRON Biotechnology, Inc KOREA) and centrifugation, the supernatant was extracted. The extract was electrophoresed on a 10% polyacrylamide gel, and transferred to a nitrocellulose membrane (Merc Millipore Ltd Germany) for transcription. The primary antibody was respectively diluted 1000-fold in TFAM (OriGene Technologies Inc USA), SOD (Enzo Life Science Inc USA), and catalase (LifeSpan BioScience Inc USA). β-actin (abcam P.L.C JAPAN) was diluted 10,000-fold. The primary antibody was reacted over night at 4℃ while being shaken. After reacting the primary antibody, the secondary antibody was diluted 1000-fold and incubated with goat anti-rabbit Immunoglobulins/HRP (DAKO JAPAN) for TFAM, SOD, and catalase, and goat anti-mouse Immunoglobulins HRP (DAKO JAPAN) at 1000-fold dilution for β-actin. The membrane was immersed in ImmunoStar (WAKO Pure Chemical Industries JAPAN), and photographed digitally with LAS-4000 mini (Fuji Film, JAPAN). 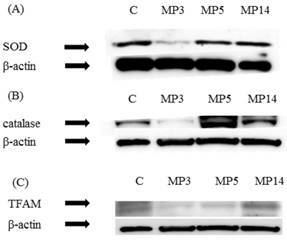 At 3 days after MP administration the pattern of tissue changes considered to be related to the development of osteonecrosis was found, and so we decided to perform Western blotting on the 3rd, 5th, and 14th days after MP administration. On Western blotting expression of SOD, catalase, and TFAM was noted at 25kDa, 60kDa, and 27kDa respectively. Expression of SOD, catalase, and TFAM in liver, heart, kidney, humerus, and femur in C group SOD and catalase showed significantly decreased expression in the humerus and femur as compared with liver, heart, and kidney. 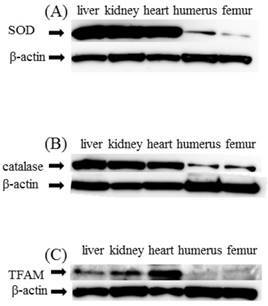 TFAM too like SOD and catalase showed significantly decreased expression in humerus and femur as compared with liver, heart, and kidney (Figure 2(A)(B)(C)). Histopathological study (A) control group. (B) MP14 group ((A), (B)×200). Osteonecrosis was not found in any of the animals in either C group. In MP14 group, osteonecrosis was found in 7 of animals (70%).Osteocytes in the stained bone contain achromatic nuclei or empty lacunase, showing typical features of osteonecrosis. Medulally hematopoietic cells around the site of osteonecrosis are interspersed with necrotic and degenerated cells. In vivo, at the same time when reactive oxygen species (ROS) are used for oxygen reactions and energy production antioxidant defense mechanisms are prepared. Of these, SOD which is a factor related to oxidative injury is metabolized to oxygen and hydrogen peroxide, and then further metabolized to oxygen and water by catalase and thereby detoxified . In experiment 1 having noticed that steroid-associated necrosis occurs in bone, we conducted a site-specificity study in which the expression of SOD and catalase in liver, kidney, heart, humerus, and femur was compared in steroid non-administered rabbits. The expression of SOD and catalase was found to be decreased in humerus and femur as compared with the other measured sites. This result means that the expression of antioxidant enzymes in the humerus and femur is less than that at other sites, placing these sites in a state in which homeostasis is difficult to maintain to begin with. Accordingly we speculate that these sites are already exposed to an environment that renders them particularly susceptible to oxidative injury. In addition, we demonstrated in a biochemical experiment that almost all mitochondria transcription factor A (TFAM) is present in a state bound to mitochondrial DNA. Its dual roles as a transcription promoting factor that binds to the transcription promoter region and as a structural protein that non-specifically binds to mitochondrial DNA thereby maintaining its structure and stability are known, as is its contribution to the maintenance and stabilization of mitochondrial DNA. Furthermore, using RNA interferometry (RNAi) the expression of TFAM, which is the main higher order structure protein, was eliminated. Then serial changes in the amounts of TFAM and mitochondrial DNA were followed and found to fluctuate almost completely in parallel. That itself has been considered applicable when determining the number and function of mitochondria, and it is known that mitochondrial DNA repair and cell necrosis are influenced by mitochondrial DNA damage. Furthermore, a decrease in TFAM is thought to induce mitochondrial DNA damage  . Mitochondrial expression shows organ specificity, and has been suggested to be relatively intense in metabolically active organs such as liver, kidney, and heart, although no comparisons with the femur or humerus are available. Like in experiment 1, when TFAM expression was compared in liver, kidney, heart, humerus, and femur in steroid non-administered rabbits, expression was less in the humerus and femur as compared with other sites. We attribute this result to the fact that as compared with other sites the number of mitochondrial repair factors is low to begin with, so that when in the humerus and femur factors adversely affecting mitochondria are added on an environment uniquely susceptible to mitochondrial injury is created. Western blot study (A) SOD, (B) catalase (C) TFAM. Serial changes of SOD, catalase, and TFAM in the femur as a control, β-actin is shown in the respective lower panels. In MP3 group as compared with C group expression was significantly decreased (A,B). In MP3 group and MP5 group as compared with C group expression was significantly decreased, while in MP14 group expression was improved (C). In steroid-associated osteonecrosis both the femur and humerus show low levels of both enzymes from the start. Namely, oxidative injury, which is thought to be a cause of osteonecrosis, is associated with an especially intraosseous susceptibility to mitochondrial injury, suggesting that mechanical stress due to loading is one cause. In practice, when mechanical stress is imposed on the femur the proportion of osteonecrosis increases  , while decreasing the amount of mechanical stress has been found to make possible reduction of this causative factor of femoral head necrosis. Furthermore, as accumulation of oxidative stress due to excessive free radical production induced by mechanical stress has also been reported , the femur and humerus can be considered tissues exposed to excessive stress from the start making them especially vulnerable when then subjected to overload as well. Next, when in this study the susceptible to injury femur was serially evaluated after steroid administration, the intraosseous expression of SOD and catalase was found to decrease within 3~5 days and then increase on the 14th day. It is thought that within 3~5 days of steroid administration oxidation-reduction homeostasis in bone can no longer be maintained, with a state of severe peroxidation developing, and consistent with previous reports oxidative injury was confirmed to occur. By the 14th day repair mechanisms also start to work, with this thought to account for the tendency to improvement found. Similarly in the case of TFAM, intraosseous TFAM expression decreased within 3-5 days after steroid administration, showed improvement on the 14th day, and was thought to have been activated in the same way as antioxidant mechanisms. This result suggested that when the femur and humerus, which are the sites of predilection for necrosis development in this model, and which have a background susceptibility to stress, are exposed by steroid to even greater stress the development of osteonecrosis is promoted. As preventative countermeasures an increasing number of experiments focusing on ways to mitigate oxidative stress have been conducted in recent years, although no such experiments focusing on mitochondria have yet been published. Since the administration of TFAM has been reported to help prevent cellular and tissue degeneration thereby helping to avoid the progression of various pathophysiological conditions  , future studies will need to consider whether TFAM administration similarly has a role to play in the inhibition of osteonecrosis.